Among salmon fly enthusiasts, toward the end of 19th century is commonly referred to as the "golden age" as that was when gaudy and colorful patterns with exotic feathers were introduced by George Mortimer Kelson, Major John Popkin Traherne, Sir Herbert Maxwell, Captain J. H. Hale and a few others. Even during my initiation period, I saw these names along with fly patterns and their book titles. At that time, as I have reviewed in early chapters, my priority was to get the skills imprinted on my hands and train my optical judgement. In the next level, I started to look up individual names and books. Just like I have a mentor and predecessors, these anglers/authors of "golden age" also had predecessors who should not be forgotten. One of those anglers/authors who were active in the mid-19th century was William Blacker. He was making his version of salmon flies for Belfast, Ireland. Eventually he moved to London and operated a tackle shop. In 1842, he published a book "Art of Angling", which was eventually rewritten and revised in 1855 as "Blacker's Art of Fly Making". These titles can be found with digital reproductions at online library such as Internet Archive (http://archive.org) and Open Library (http://openlibrary.org). Also there are reprinted paperback editions available. Blacker dressed many original patterns from simple fishing patterns to complicated artistic ones (we'd better keep in mind that these artistic ones were also used for actual fishing!). However, be warned. His original writing of fly recipes is not what commonly we see today (you know who did first? – Mr. Kelson did). Materials are listed in a very random order and oftentimes we have to interpret what he would have meant or intended. Luckily we have our modern version that have done all the interpretations and color photos. I don't think I'm totally wrong by saying this book (River Fork Press, ISBN: 978-0-9832835) is very much the same concept as The Essential Kelson with reproduction of past masters' legacy with modern explanations and interpretations. The author has done a superb job for dressing and interpreting. 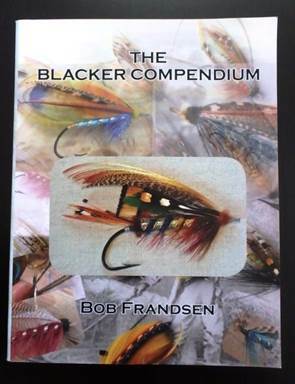 It's very concise and easy-reading and definitely is a great reference of Blacker flies all in one. It's a modern book so it shouldn't be difficult to find one. So you may wonder if I have challenged "Blacker's Fifteen". Not yet, as I've been working on other plate projects. But it's definitely on my list and I will dress all and frame them altogether. Satoshi Yamamoto, www.leftyanglerandflies.com, is an outfitter and fly-dresser in Livingston, MT.